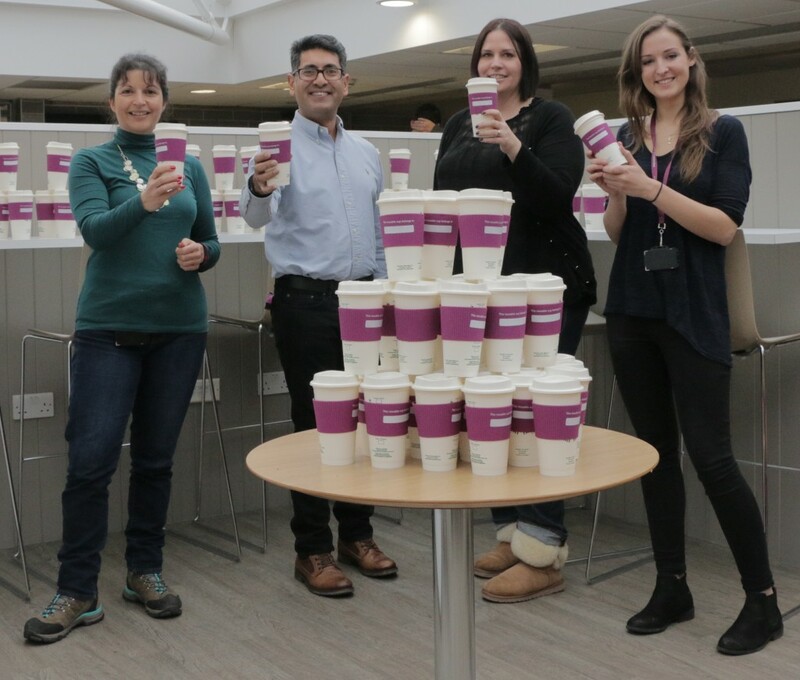 Computershare, the Bristol-based financial services company, has given each of its 1,500 employees a reusable coffee cup as it steps up its efforts to reduce waste. Staff working at the firm’s headquarters at the Pavilions on Bedminster Down started receiving the reusable cups and silicon holders for free this week as part of Computershare’s global determination to improve the environment. Every new starter will also receive one as soon as they join the firm. Computershare UK chief executive officer Naz Sarkar said: “Every week hundreds of cups of coffee are bought at our onsite café as colleagues meet and socialise together or relax during their break. “This simple step will help Computershare reduce the amount of waste sent to landfill, lower CO2 emissions and ensure more land is preserved as a habitat for wildlife. Staff members using the cup at Computershare’s onsite café, which serves Starbucks coffee, will receive a 10p discount on every hot drink. Because of the waste they save, the cups become carbon neutral after 24 uses. They are made from polypropylene, which consumes the least amount of energy during production and produces the lowest carbon dioxide emissions compared to other plastic. The initiative will help Computershare meet its global environmental policy goals, which include reducing the generation of waste, using suppliers with good environmental records and encouraging employees to act sustainably. Although the cups will cost Computershare more than £2,000 to buy, the company says the initiative will pay for itself within a year, saving £3,000 in annual waste disposal costs alone. These changes are mirrored by similar results at other offices around the world. Also, a growing proportion of the goods used at Computershare offices are now Fairtrade. Other green initiatives include a free employee bus service, which is used by 15% of Computershare employees. It runs six times a day between its headquarters and the city centre, and over the last year cleaner, less polluting buses have been introduced. Computershare has also installed a secure cycle storage area to accommodate up to 150 bikes and a drying room, which has led to a growing number of cyclists at the office. The company also replaced 243 lights across its 16-acre grounds with LED bulbs, reducing energy consumption by more than 60%. Computershare also runs a number of awareness campaigns locally to reduce waste in line with its long-term reduction targets. Since 2009 Computershare has organised a global Green Office Challenge: an annual, well-contested initiative that calls on the ingenuity and drive of employees around the globe to help the company do its bit for the environment. The coffee cup scheme is an entry into Computershare’s Green Oscars, which gives employees around the globe the chance to develop and run a sustainability project for their office or local community and then compete with fellow teams for regional and global prizes. The company’s Sustainability Team also help colleagues around the world reduce their own carbon footprints by organising an annual Carbon Games, where Computershare offices around the world go head-to-head against others in a friendly competition for funds to support a green initiative in their office.